Verden (GER), February 4, 2019 - Hanover's best young stallions are awarded with the Weltmeyer- and Stakkato-Prizes. This year, the Weltmeyer-Prize goes to the dressage stallions Despacito, Destacado, Dostojewski, Finnigan and So Unique. The breeders of the first three stallions were honoured at the show of the privately owned stallions in Verden. Finnigan and So Unique could not come to Verden, their breeders will receive the award at a later date. 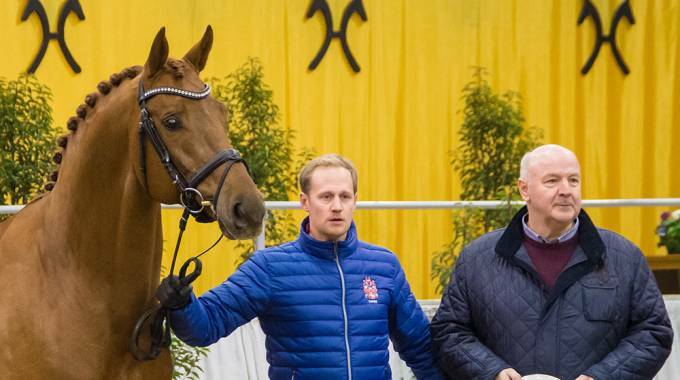 The Stakkato-Prize was awarded to the Stakkolensky breeders in the fully occupied Niedersachsenhalle – appropriately a son of the eponym of this prestigious trophy. These young stallions are among the most successful young stallions in Germany and have proven this impressively in their tests.